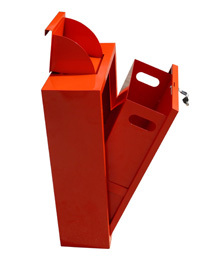 Our Enviro bins are made from Heavy Duty Zintec Steel with stainless steel hinge and are polyester coated. Enviro bins are Vandal Resistant, Fire Resistant, Flood Resistant and there is no rubber used. Our Enviro bins are available in 40 litre and 60 litre size as typically used by councils as part of their environment waste strategy. 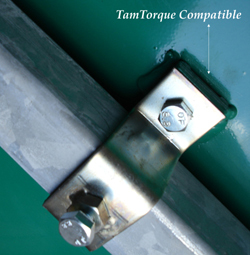 The Enviro bins can also be attached to lamp posts using a Tamtorque system. The Enviro bins are available in RED or GREEN. 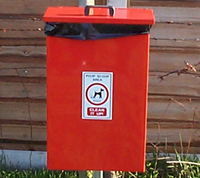 Each dog waste bin comes with a 1.8m high, 40mm square galvanised post with end caps for ground installation. Priced individually. Please see below for Prices and Color. The degradable Enviro black refuse sacks and Enviro Yellow Pet Waste Sacks suitable for these bins are available for sale online. Please see below for more information. Our Dual Envirobin is made from the same heavy duty zinctec steel as our envirobins 1 and 2, but with our new purpose designed chute lid which prevents unauthorised access to inner bin. The Dual Envirobin can be installed by post mounting or bolted into the ground throught he base of the bin. With our inbuilt drop down front it can be easily installed into the ground improving the vandal resistance aspect of the bin. The chute lid enables the public to discard of their used bags into the bin without touching the inner liner. It also helps the operator to remove the inner refuse liners without coming into contact with the waste. Our Dual Envirobins are tamper, fire and weather resistance. Bin Size : 470 x 690 x 200mm. 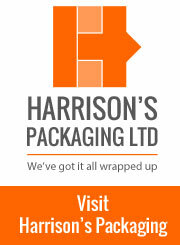 Our Enviro dispenser kits are designed and manufactured in the UK. 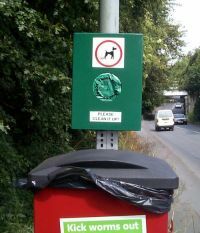 The Enviro dispenser kits are excellent way to encourage dog owners to clean up after their dogs. The Enviro dispenser is fitted with a security lock and can only be opened by a key. 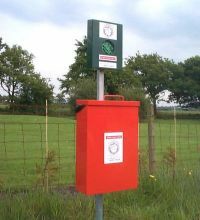 The Enviro dispenser can be fitted to a wall or attached to the pole of an Enviro Bin. The Enviro dispenser kits are metal construction and are vandal resistant. The dispensers are spring loaded to keep the bags at the front of the dispenser for easy dispensing by the public. Each poop scoop Enviro dispenser kit includes a green dispenser, 1.5m high 40mm diameter extension pole, one U bolt and four brackets and has been designed for easy fitting to an existing dog waste bin (NOT INCLUDED). 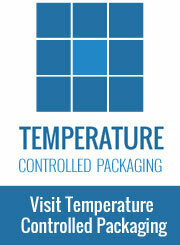 The kit is suitable for use with our specially designed dispenser Envirobags. Other colours are available, minimum quantities will apply. Our Poop Scoop Enviro dispenser is the same as above BUT only comes with a 76mm U bolt to fit a 75mm post as per the picture to the left. If you wish to attach the Enviro dispenser directly to an existing or new Enviro bin then you will require the dispenser kit as detailed above. The Enviro Dispenser is suitable for use with our specially designed dispenser Envirobags. 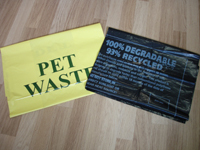 We stock yellow Enviro pet waste sacks and black degradable Enviro refuse sacks which can be used with our Enviro Bins. The black Enviro refuse sacks are 100% degradable and once in contact with moisture and oxygen the degrading process begins. Our Enviro refuse sacks are 460mm x 725mm x 850mm (18" x 29" x 34").